A small but very handy application for taking and managing notes. 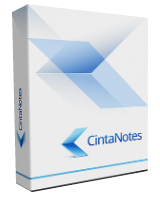 Cinta Notes Pro 3.1.4 was available as a giveaway on July 12, 2016! Please note: The software provides free updates till 25 July, 2016. You can download a portable version of the program here (5.1 MB). You can learn more about the program here: Promo video or Quick Start Guide. "Cinta" means "love" in Indonesian and probably Malay. The C is pronounced like English CH, as in chip. I downloaded the portable version from their web site. My first complaint is it has dark background with black text (very hard to read). Looked for color settings, and all I could find was color themes, none of which allowed switching to plan white background. I wish young programmers would stop getting flashy/smarmy by foisting dark backgrounds on to us. For those looking for the (versions) Comparison page, here it is - http://cintanotes.com/pricing/ I downloaded the portable version from their web site. My first complaint is it has dark background with black text (very hard to read). Looked for color settings, and all I could find was color themes, none of which allowed switching to plan white background. I wish young programmers would stop getting flashy/smarmy by foisting dark backgrounds on to us. There are all kinds of hotkeys listed on the help page or at http://cintanotes.com/keyboard-mouse-shortcuts/ if you're like me in preferring keyboard use. 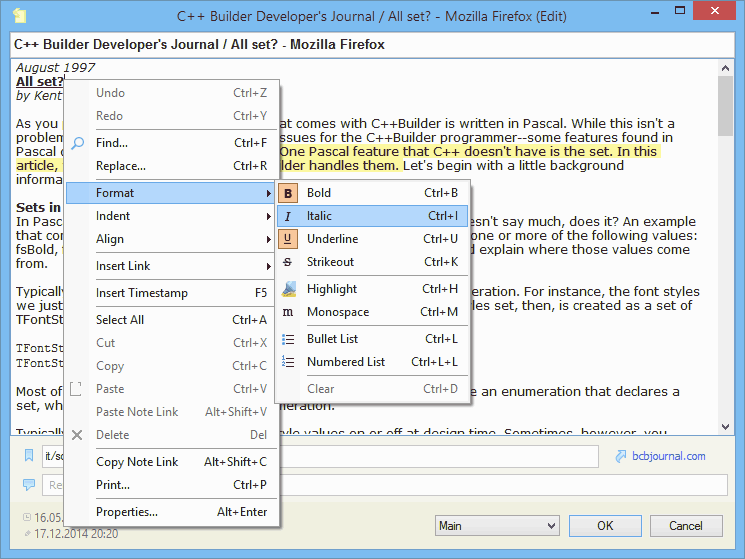 There are easy ways to copy to/from other programs, even better than the venerable Ctrl+C, Ctrl+V. It can be used portably on a USB drive. It can sync with SimpleNote, 3rd-party cross-platform service/apps that also support multi-user collaboration on individual notes. Support from the dev has always been prompt, friendly, and helpful. active, helpful and honest participation in this giveaway conversation. It is rare but when it happens it speaks volumes for the software and the people behind it. Well done Alex !! I would recommend to anyone looking for this kind of program to take a look at this. The terms of installation for this offer are superb by any giveaway standard (and I've tried them all on 20 + web sites over the past 20 years). There are many similar apps to CINTA NOTES and many that can do some additional functions, but you always have to trade of something in one app compared to another. Could be speed, UI, software updating frequency by the developer, proprietary data format etc, etc. For me the most important is NO cloud dependency and NO proprietary data format. I want to always decide who has access to my data and don't want to worry how I will access/transfer years of collected info if the app stops being developed for the next op. system. Just my 2 cents...and of course thanks to the developer and GAOTD for a useful giveaway !!! I would like to comment Alex (developer I assume or cust. rep) for his active, helpful and honest participation in this giveaway conversation. It is rare but when it happens it speaks volumes for the software and the people behind it. Well done Alex !! I would recommend to anyone looking for this kind of program to take a look at this. The terms of installation for this offer are superb by any giveaway standard (and I've tried them all on 20 + web sites over the past 20 years). There are many similar apps to CINTA NOTES and many that can do some additional functions, but you always have to trade of something in one app compared to another. Could be speed, UI, software updating frequency by the developer, proprietary data format etc, etc. For me the most important is NO cloud dependency and NO proprietary data format. I want to always decide who has access to my data and don't want to worry how I will access/transfer years of collected info if the app stops being developed for the next op. system. Just my 2 cents...and of course thanks to the developer and GAOTD for a useful giveaway !!! soft user, thanks a lot for your kind words! Greatly appreciated! I completely agree about Cinta being a lot more attractive because it's not dependent on some cloud server that might disappear one day - and I don't always want to trust unknown third parties (or potential hackers) with my private info. I appreciate the company rep answering questions here and I love that the SQL data format doesn't lock me into some specific software. I installed the download just in time and it works well so far - I would just request for the future that the main window colors have more contrast for readability. Thanks, Cinta (Alex) & GOTD! I completely agree about Cinta being a lot more attractive because it's not dependent on some cloud server that might disappear one day - and I don't always want to trust unknown third parties (or potential hackers) with my private info. I appreciate the company rep answering questions here and I love that the SQL data format doesn't lock me into some specific software. I installed the download just in time and it works well so far - I would just request for the future that the main window colors have more contrast for readability. Thanks, Cinta (Alex) & GOTD! download and unzip OK. Setup activates and loads page that says it activated. The problem is it doesn't install anything. Nothing in start menu. Nothing in program folders. Never experienced this before. download and unzip OK. Setup activates and loads page that says it activated. The problem is it doesn't install anything. Nothing in start menu. Nothing in program folders. Never experienced this before. Any thoughts on this? stan, disactivate your antivirus both during download of the files and installation. stan, disactivate your antivirus both during download of the files and installation. I hope it helps. From other comments, it sounds like the normal installers from the homepage should also work. Have you tried downloading from there instead? Did you download the portable version or the full-install one? If the former, might explain why it doesn't seem to be installed anywhere... From other comments, it sounds like the normal installers from the homepage should also work. Have you tried downloading from there instead? stan, probably you've downloaded a portable version which doesn't require any installation and can be run after being unzipped. We also have an installed version which can be downloaded from http://cintanotes.com/download. Hope this helps! Unnecessary software. $39.00 or FREE, does it matter. Kлип, Because this software, like others like it and as opposed to Notepad, etc., let's you organize your info.-- it makes miles of difference. Try it and you'll see. I choose to install the portable version. In order to receive the key you must provide an email address. First I tried my Yahoo account. That was no good as after 30 minutes there is still no response. Next I tried my Hotmail account. Immediately I received the key in my spam folder. So if you have any trouble with one email address, try another one. Thank you GOTD team and Cinta Software. "Slow & steady. With Cinta Notes!" Never mind, Cinta Notes can't display images. You have to download them, create a note, add the picture, click to see the image! Not productive. Uninstalled "Slow & steady. With Cinta Notes!" "The software provides free updates till 25 July, 2016" A few days? what happens after that? Will my notes disappear, or will the software go back to the free version? Also, can you merge two or more notes? This drives me crazy on OneNote! You'd think the geeks at MS would realize that a NOTES app would need to do that. "The software provides free updates till 25 July, 2016" A few days? what happens after that? Will my notes disappear, or will the software go back to the free version? Also, can you merge two or more notes? This drives me crazy on OneNote! You'd think the geeks at MS would realize that a NOTES app would need to do that. Since my second comment was deleted by mistake, I'm sure, here goes my final review: Not useful as a Onenote replacement. To add a pic you have to: Download pic, make note, insert pic, double click on note, double click on attachment! see pic!! Can you say unproductive? OneNoteHater, You still have your program and notes, but just no further updates to it. Pretty much a norm with freeware offers like this. OneNoteHater, we value negative feedback even more than positive one. Could you please forward your feedback to support@cintanotes.com, maybe some of the problems can be resolved? Thanks! Before I download and install anything from GOTD anymore, I read the reviews. I already have MSOffice with OneNote. Richard Sebire, You might think of this as a simpler form of OneNote--less features but simpler to use. I use programs like this on my PC desktop for quick notes and the like, and find it good for that purpose more than the more complicated OneNote. Thank you Mike, but I will give this one a miss..
Mike S., Thank you Mike, but I will give this one a miss..
Cinta Notes is a very useful program. I can attest to that. "Failed to connect. Please try again later." Just wondering, is it just me? Maybe your firewall is blocking the internet connection? I would definitely look at it. Or, it could be your antivirus, and if so, temporary disable it to allow the installation. Joe M., Maybe your firewall is blocking the internet connection? I would definitely look at it. Or, it could be your antivirus, and if so, temporary disable it to allow the installation. connection and sometimes I think that can be the culprit. good heads up to remember. Thanks so much for the tip! I look forward to what's next for CintaNotes. It has been and can be quite a time saver. comment you presented me with as well. Joe M., do you use a proxy server to connect to internet? Also consuella is correct to suggest checking firewall and AV software. Joe M., Glad to hear that the problem is resolved for you. Just for further reference, if you use a proxy server you need to tell CN about it using the Options/System/Proxy Settings menu. Greatest Text Database I've ever seen (and I've seen them all). Greatest Text Database I've ever seen (and I've seen them all). Highly recommended for everyone. I have been using Pnotes free version for quite sometime now. There is also Pro version which is free. I am not getting my head on which to use for note taking; full time! Can anyone test and see which is the better of the two. I have been using Pnotes free version for quite sometime now. There is also Pro version which is free. http://pnotes.sourceforge.net/ I am not getting my head on which to use for note taking; full time! Can anyone test and see which is the better of the two. They both can be very effective note-taking tools. With CN, you can use a keyboard shortcut (Hot Keys: "Ctrl+F12"
have to type it in or copy and paste it. that could be put to good use. depending on my particular need at the given time. Joe M., Thank you for reminding me of that, Ctrl + F12 a useful hotkey which went over my head. Maybe its the first time i am using it. Therefore i am not too familiar with Cinta notes. But that hotkey was the very thing i was looking for in a note taking application. Thank you for your review. PNote is fine as well, i will settle with both of them. Thank you GAOTD for todays offer. Joe M., Thank you for reminding me of that, Ctrl + F12 a useful hotkey which went over my head. Maybe its the first time i am using it. Therefore i am not too familiar with Cinta notes. But that hotkey was the very thing i was looking for in a note taking application. Thank you for your review. PNote is fine as well, i will settle with both of them. Thank you GAOTD for todays offer. programs which are feature rich. of these apps. They both can serve similar purposes. and do them quite well to boot. be Ctrl+F12. It can be whatever is more convenient to you. Have a good evening and thank you! Good timing with the demise of a good, FREE Evernote (which I first found HERE years ago right before they went free! ), but I already left Evernote and went with the FREE OneNote. Yeah, it is M$, but I have access to my stuff on ALL my devices and on the web, and M$ made it really simple to convert all my notes to it. Standalone programs like this (and those you must pay to use) don't stand a chance these days with multi platform programs, but thanks GAOTD... I have found some great software from you over the years and have bought many programs because you had offerings for us to try for much longer than trials! Good timing with the demise of a good, FREE Evernote (which I first found HERE years ago right before they went free! ), but I already left Evernote and went with the FREE OneNote. Yeah, it is M$, but I have access to my stuff on ALL my devices and on the web, and M$ made it really simple to convert all my notes to it. Standalone programs like this (and those you must pay to use) don't stand a chance these days with multi platform programs, but thanks GAOTD... I have found some great software from you over the years and have bought many programs because you had offerings for us to try for much longer than trials! This GOTD is an excellent product. I use it mainly to save my posts in forums, and to replace Ctrl-C in some instances. Even the free version is nice to use. I used free version of CN and I can tell that it's flexible and easy to use. It could have been my main note taking app, however the paid version was too expensive for me so I quit. This free giveaway is definitely worth a try. why can't we rename or create a tag that's session related e.g. date and source application title on CTRL+F12 created notes so they all don't get grouped together from days or even years of hot key created notes? TK, not sure I understand what you mean, but it seems that soon CintaNotes will be able to do this. In version 3.2 we plan to add Autotagging Rules. Basically you'll be able to have CintaNotes tag notes automatically for you based on user-defined conditions. Alex Jenter, Will this necessary upgrade be part of the "free updates till 25 July, 2016." ? Alex Jenter, That would be ideal! potentially automating the entire note making process from just selected text. I have a problem. Desktop versions - O.K. Portable versions of USB. Change the language in cintanotes.settings to CS in notepad. After starting the program automatically overwrites back to EN ???? mikik, probably CN was still running while you edited the settings file. It is recommended to change the language via Options/Language menu. mikik, probably the problem is with GAOTD installer, not the program itself. could you please try downloading the program from http://cintanotes.com/download? If the problem persists, please drop me a line to support at cintanotes.com. Thanks! mikik, probably the problem is with GAOTD installer, not the program itself. could you please try downloading the program from http://cintanotes.com/download? If the problem persists, please drop me a line to support at cintanotes.com. Thanks! I have a desktop version for PC and portable version on a USB flash drive. 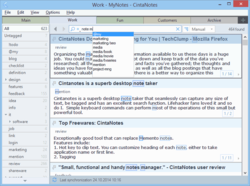 You can use the desktop version of cintanotes.settings to Portable? That would be the simplest solution. Data is minimum - is not important. Hi Alex Jenter, I have a desktop version for PC and portable version on a USB flash drive. 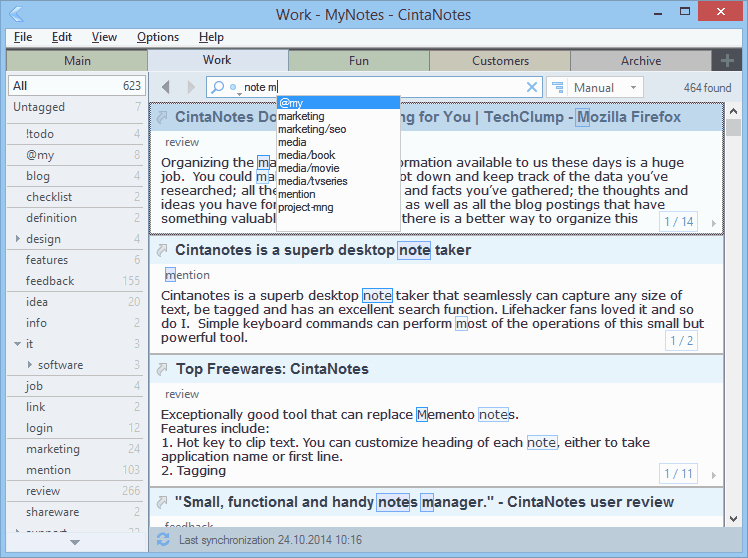 You can use the desktop version of cintanotes.settings to Portable? That would be the simplest solution. Data is minimum - is not important. An error is detected. After downloading I used Decompress Total Commander. And he did not create subdirectories :-(. Everything was in one directory. mikik, I wouldn't recommend that. Some paths stored in the settings file could be wrong for the portable version. It's better to try deleting settings file altogether. Downloaded and installed easily on Windows 10 64 bit. Registration quick and easy. A nice programme, bit of a learning curve but YouTube has videos which help. Very hard not to compare it to OneNote, which I am familiar with and is my main 'goto' for this type of work. The main difference that I can see is that this saves to disk rather than the cloud. Having said that, saving to the cloud has some advantages as I use several machines. In the short time I have had to play, it seems a competent and useful programme, but I think I will be sticking with OneNote. Thank you Cintanotes and GAOTD for the offer. Downloaded and installed easily on Windows 10 64 bit. Registration quick and easy. A nice programme, bit of a learning curve but YouTube has videos which help. Very hard not to compare it to OneNote, which I am familiar with and is my main 'goto' for this type of work. The main difference that I can see is that this saves to disk rather than the cloud. Having said that, saving to the cloud has some advantages as I use several machines. In the short time I have had to play, it seems a competent and useful programme, but I think I will be sticking with OneNote. Thank you Cintanotes and GAOTD for the offer. Kestrel, thanks for your review! 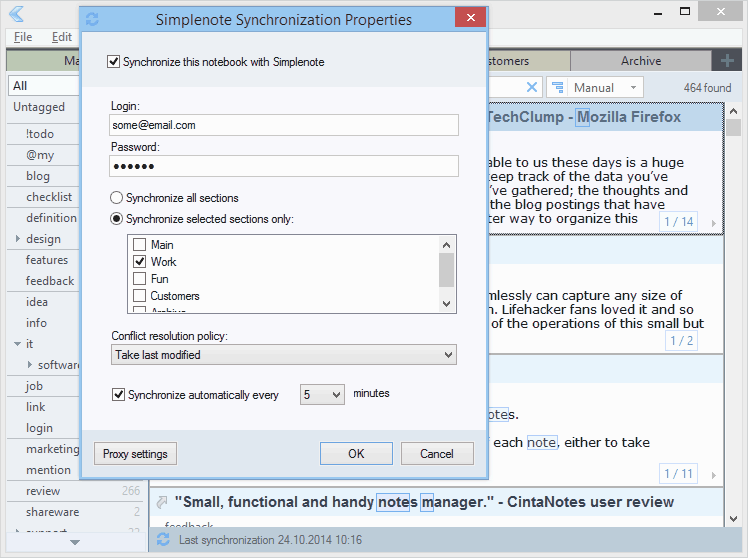 Please note that CN can sync with Simplenote, saving notes to the cloud as well. Moreover, you can choose which sections to sync. Kestrel, thanks for your review! 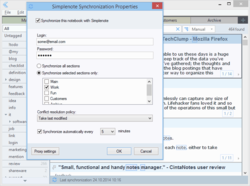 Please note that CN can sync with Simplenote, saving notes to the cloud as well. Moreover, you can choose which sections to sync. I use dropbox and cubby to save to the cloud. Just point those programs to include the CN save folder. I find this a lot better than using a programs built in cloud thing. With dropbox and cubby I have complete control over the files that are on there. I don't like onenote. CN can export to txt, html and xml. All plaintext, human readable, non proprietary formats. I don't like my data locked to microsoft proprietary formats. Kestrel, I use dropbox and cubby to save to the cloud. Just point those programs to include the CN save folder. I find this a lot better than using a programs built in cloud thing. With dropbox and cubby I have complete control over the files that are on there. I don't like onenote. CN can export to txt, html and xml. All plaintext, human readable, non proprietary formats. I don't like my data locked to microsoft proprietary formats. Lim, I haven't used Dropbox myself, although I have received files that way. Sounds interesting so I'm going to have a look. Thank you for the advice. "Please note: The software provides free updates till 25 July, 2016." "Please note that this license is limited to the current version of CintaNotes (no free updates), and doesn't include technical support." Description above says: "<b>Please note: The software provides free updates till 25 July, 2016.</b>" but taken from http://cintanotes.com/gaotd "Please note that this license is limited to the current version of CintaNotes (no free updates), and doesn't include technical support." Who's telling the truth? TK, there will be free updates till 25 July. Fixed the key generator page.Thanks for noticing this discrepancy. Instructions in English would help for the portable version. I agree the included instructions are in English.But it's OBVIOUS you didn't try and install the portable version.... I read well, BUT NOT Russian, or whatever language it was that the installation file appeared in......... Maybe you should go through the motions before commenting. Hasenkoetter, I agree the included instructions are in English.But it's OBVIOUS you didn't try and install the portable version.... I read well, BUT NOT Russian, or whatever language it was that the installation file appeared in......... Maybe you should go through the motions before commenting. Hasenkoetter, check again, there is no help file in the portable version. It launches a browser window to their online help only! Would only take developer less than a minute to compile that page into a chm file and include it in the portable folder directly! Only other instruction is readme.txt file in english but that is not the Help file data.but mostly version history data. TK, CN used to include a local help file. But after we added a large number of screenshots and images to help, the size of it grew so much that it took 2x times the size of the program itself. People started to complain about the size. This is why we decided to leave online help only. 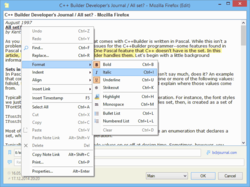 Who needs local help can save it to MHT or PDF with a couple of mouse clicks. Nigel, our portable version doesn't have an installer. Probably this is an issue with the GAOTD wrapper. Please try downloading CN from cintanotes.com directly. Nigel, our portable version doesn't have an installer. Probably this is an issue with the GAOTD wrapper. Please try downloading CN from cintanotes.com directly. Nigel, looks like the WinZip self-extractor is showing everything as either Cyrillic or as "????" on my system. Since I haven't memorized the buttons in English, I am unable to install. Nigel, I used 7-zip to look in sfx and extract, I didn't even try running the SFX module! Just did in response to your comment... sheesh is that a mess! ?????? ??????????? ??? ?????? ?????? ????? ??????? ?????? ????? ?????? ??????? ?????? ????? ??????? ????? and so on plus non-english buttons, someone at GAOTD didn't test the portable installer very far! Nigel, I used 7-zip to look in sfx and extract, I didn't even try running the SFX module! Just did in response to your comment... sheesh is that a mess! ?????? ??????????? ??? ?????? ?????? ????? ??????? ?????? ????? ?????? ??????? ?????? ????? ??????? ????? and so on plus non-english buttons, someone at GAOTD didn't test the portable installer very far! the problem with the portable version was detected and corrected! Nigel, I did not use the portable from the link above, but from the link with the e-mail with the name and key. That portable version came in English. With In cintanotes.settings language = nl i got a Dutch version. I did not encounter any Russian version. No worries, I tried clicking each box until it installed, then transferred the file from my desktop to laptop. But thanks for the suggestion. Alex Jenter, No worries, I tried clicking each box until it installed, then transferred the file from my desktop to laptop. But thanks for the suggestion. How is it with licenses (portable vs. desktop, PC vs. NB)? Only one or more devices? A synchronization PC vs. NB? How is it with licenses (portable vs. desktop, PC vs. NB)? Only one or more devices? A synchronization PC vs. NB? Hi Mikik, license is for 1 user, valid for both portable and desktop, for any number of devices. user-friendly note taking application. CintaNotes Portable lets you quickly save and tag any useful information that you come across or just need to jot down ..., the program can be placed on the use of flash drive or Dropbox or SugarSync settings to achieve multi-computer Synchronize. Please note that with this license you'll have free updates only till July 25, 2016. Also this license doesn't include technical support.